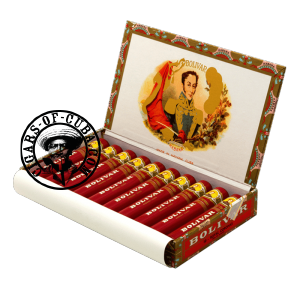 Very different from the rest of the Bolivar family, this is a mild to medium bodied Robusto that is far smoother in smoke than the usual Bolivar cigars. This cigar explores sweet fruity, earthy and woody aromas without ever being aggressive. This combination of controlled power and seductive sweet flavors makes this Robustos very popular for the modern smoker. Tubos presentation makes it all the more fun. Earthy with some woody and spicy smells. This generous Havana must be controlled. Smoke it very slowly by taking small regular puffs. This is a rustic Havana, delivering an earthy spicy smoke. The final gives extra hints of black pepper. After a spicy dinner or with a great strong digestif, light up a Royal Co.